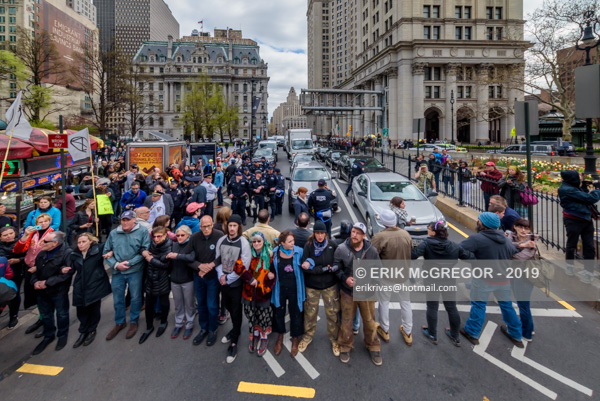 New York, NY – Activists from Extinction Rebellion New York City (XR-NYC) engaged in nonviolent direct action to confront climate change outside City Hall on April 17, 2019, to demand a declaration of Climate Emergency and the pursuit of policies to reach zero emissions in the city by 2025. 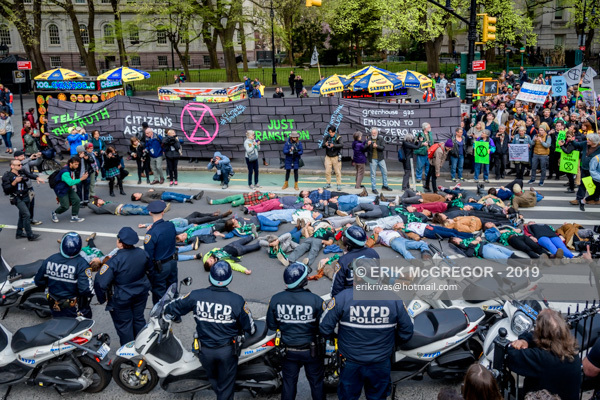 Extinction Rebellion NYC is joining similar Extinction Rebellion (XR) actions happening in 38 cities in the U.S. and 49 countries globally, during “International Rebellion Week” to escalate protest and demand immediate government action, alerting the world to the climate emergency. 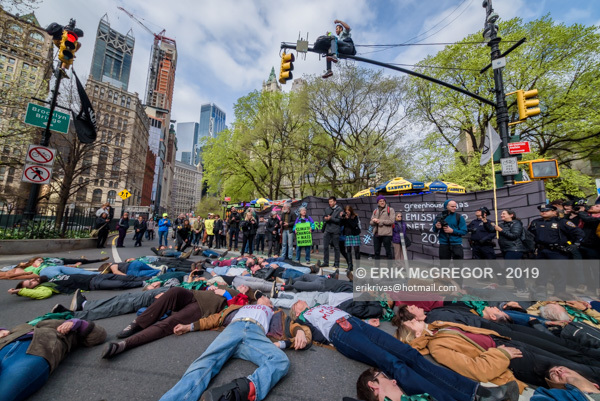 It has been estimated that if the Climate and Community Protection Act (New York State) and the Climate Mobilization Act (New York City) both pass, as well as proposed congestion pricing, there will be somewhere between a 10 – 20 percent reduction in emissions by 2030, and an approximately 50 percent reduction by 2050, which is utterly inadequate. 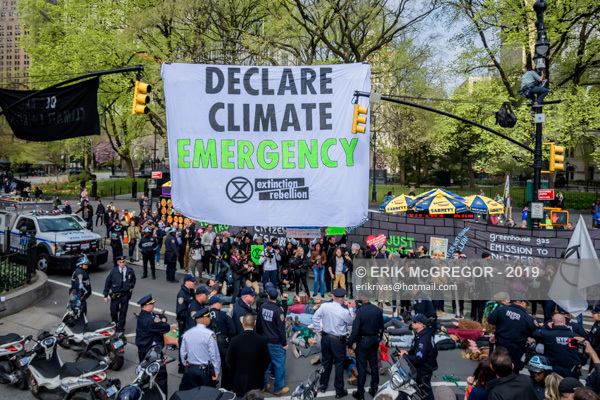 We demand that our government Tell the Truth and declare a climate emergency! 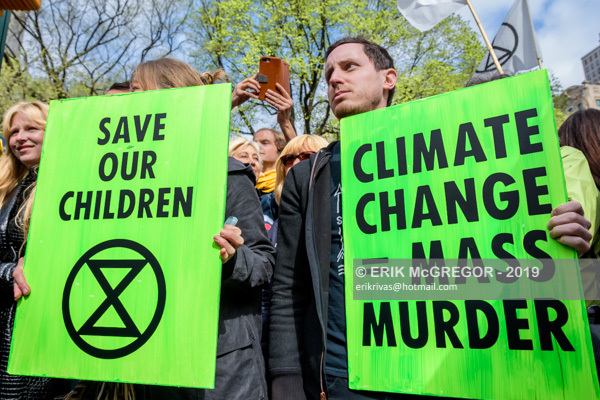 While there’s lots of news about climate change and its impacts, the media and government are not telling the whole truth about the full impact of climate change: mass migrations, food shortages, more severe flooding and drought, wildfires and mass die-offs. 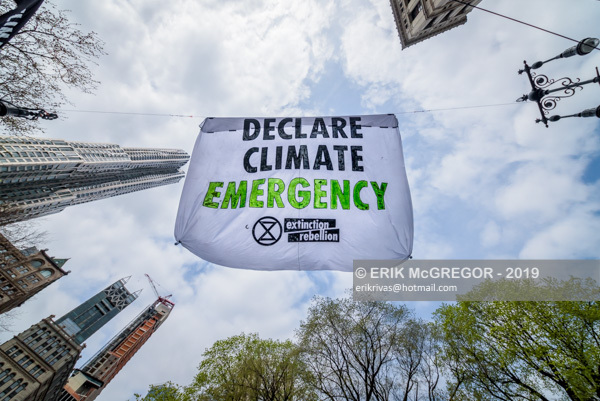 Come to City Hall to demand a declaration of climate emergency. 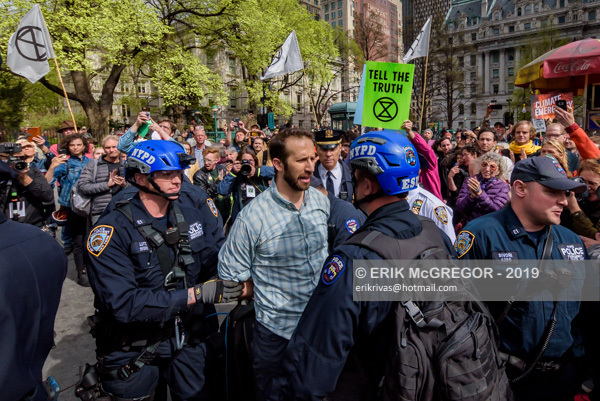 This won’t be just another rally or speeches, this will be a group of passionate people raising their voices during the most serious crisis of our time. 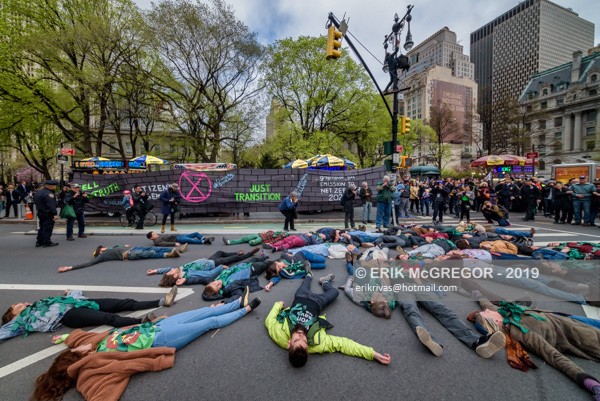 The current administration is pouring money into protecting the financial interests, while leaving most of NY to suffer the fates of climate induced flooding – we demand that they Tell the Truth about the dire situation and take bold action to respond. 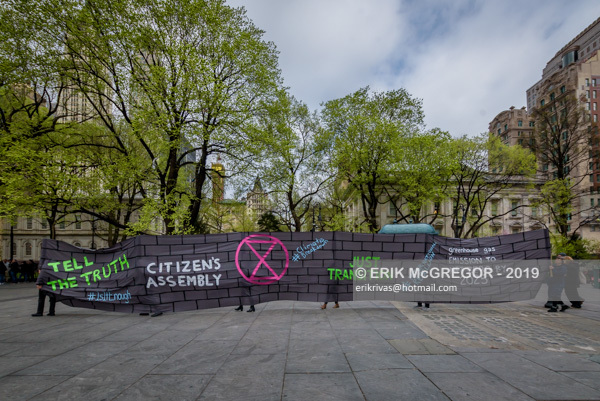 Government must tell the truth by declaring a climate and ecological emergency, working with nother institutions to communicate the urgency for change. 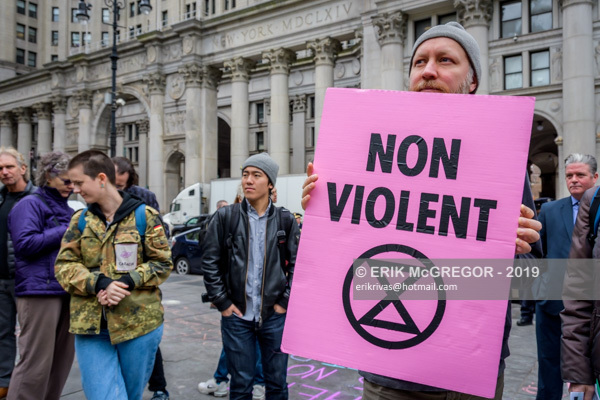 We demand a just transition that prioritizes the most vulnerable people and repairs the effects of the ongoing ecocide. 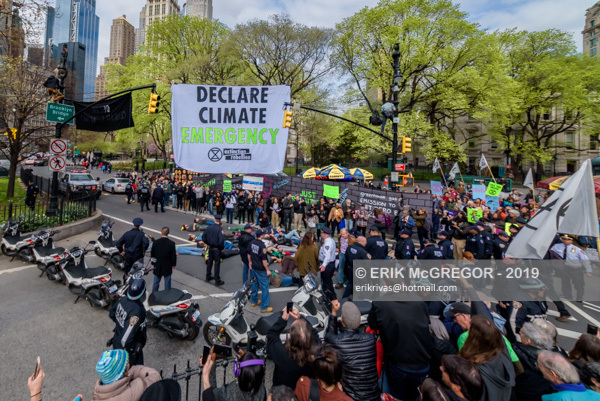 The Extinction Rebellion movement around the globe has been taking to the streets and engaging in direct action to demand that the world’s governments Tell the Truth and Declare Climate Emergency Now. 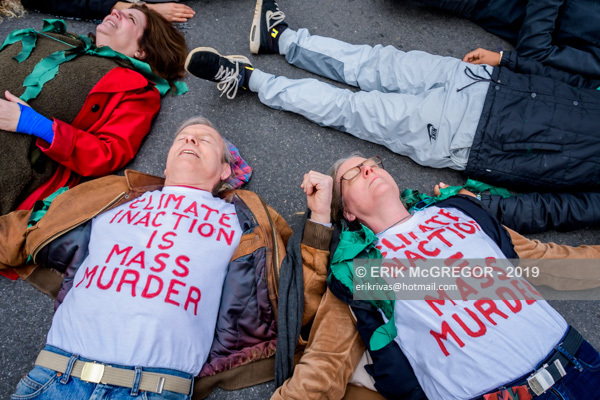 Without unprecedented action to achieve the immediate drawdown of the carbon economy, the Earth is in its Sixth Mass Extinction.